My journey to work on my Kawasaki Z750 was becoming unnecessary now that the dark nights and late sunrises have got under way and we are now into Winter. So for the last couple of weeks I have had the opportunity to use the FT-857 on 20m and 2M from in my Toyota Estima Lucida mobile Ham shack. Conditions have been quite remarkable most mornings at around 8.00utc as I embark on my work bound journey, I am listening up and down 20m ever hopeful of some distant signals. Recently without to much tuning around I have come across some big signals, real 5/9 from the Far East. Last week I heard a few VKs on the morning run as well as ZL1BD, who boomed through and as usual with a large following from G-land and Europe. AL ZL1BD was loud again this morning at around 8.15utc on 20M, but my 50w doesn't always manage the job. :-( Especially during the early morning pile ups h.i! The biggest surprise this week was again around 8.10 utc, when I heard Bejing-China and also Japan both on separate occasions with 5/9 signals. Unfortunately only received and again did not quite make the journey back, but as and when the cycle gains momentum I will stand a better chance. I did manage to make QSO with Satellite confirmed qsl and fellow Ham jose EA3AGH, this morning on 20m. It was great to hear Jose on 20m instead of the usual AO-51 amateur satellite, Jose EA3AGH was coming through very well on HF. I have still got the same antenna, Maldol HFC-20 and as previously reviewed, it still works very well indeed! The HMS-6S will get a good trying out as soon as I get some spare time. Over the past couple of weeks, I have been considerably busy with little time available to play radio in the evenings. Even so, I have managed one or two PSK31 contacts on 40M and 80M as well as receiving weather Fax's from NORTHWOOD's nautical, meteorological and information centre. 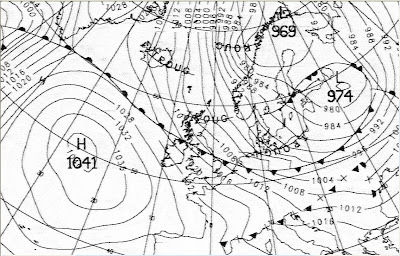 The Fax's show detailed images and information regarding weather fronts and can be very interesting as well as very easy to receive. 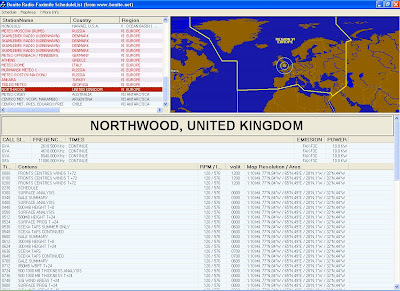 NORTHWOOD is just one of the many Ground Stations transmitting weather FAX and DATA. Signals can be easily received on multiple bands at the same time during each transmission, ensuring good reception at any time of the day depending on which particular band provides the best conditions to your location. The short wave band is very accommodating and you will find plenty of signals to receive and decode. 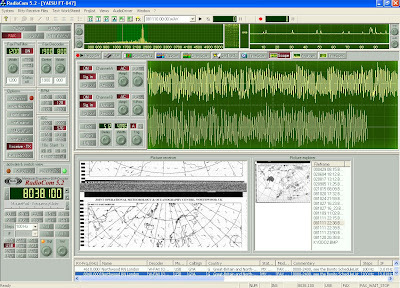 I use Radio Com 5.2 to decode the Fax transmissions, just the same way as the NOOA weather satellite transmissions. Computer: 3800 Dual Core, 2 Gig Ram, 512MB Graphics, Creative Sound Blaster Sound card, 160Gb HD, Window XP SE. Interface: Phono leads, TX via CAT Cable and Nomic Rig Blaster. I find this side of the hobby equally as interesting as the many other forms of radio communications, I hope you find this interesting and look forward to hearing about any of your experiences and comments. Check out M1PAC new web blog with some interesting antenna arrays as well as other goodies! IT Is Well worth a look!! I can't wait to get all my equipment up and running the weather has been terrible but this weekend looks good. looking forward to see the full set up. 73 keep up the good work!